A nationwide search by an expert jury from the Australian Institute for Landscape Architects for 2016 found Nature Play next to the Royal Children's Hospital in Parkville to be the country's best. 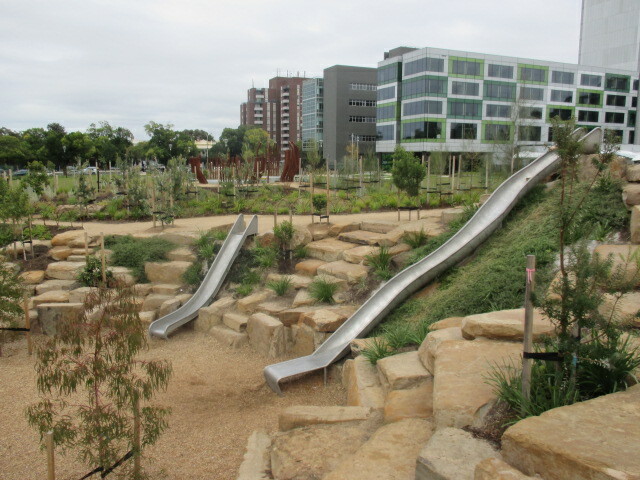 Australian Institute for Landscape Architects head Shahana McKenzie said the park sets the standard for engagement between children and the city. 'It's so important to invest in the outdoor environment for our children and the flow-on physical, emotional, social and health benefits,' Ms McKenzie said. Ms McKenzie said research showed the physical and mental health benefits of playing outdoors, including lower levels of stress, improving development and encouraging creativity and social skills. Nature Play beat 44 other entrants in the competition ranging from adventure playgrounds to crossfit circuits, waterplay and senior fitness courses. The Royal Park playground 'Nature Play' was opened in 2015 as a nature-based playspace in Parkville. It's been built on the site of the previous Royal Children's Hospital and is adjacent to the new hospital, on the corner of Flemington Road and Gatehouse Street. The playground is huge, with lots of different play experiences to explore. Other facilities include picnic tables, seating, a drinking fountain and two BBQ areas. Free parking is available on most of Gatehouse Street and paid parking on Flemington Road. Please note: there are no public toilets nearby.